Sciblogs | What do you think is the most influential science/technology breakthrough? What do you think is the most influential science/technology breakthrough? 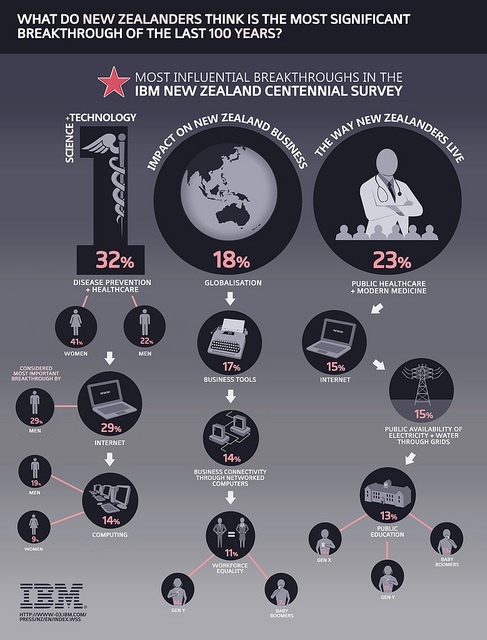 IBM has released results from surveys of 1000+ people from different countries, asking what they considered the most important technological ‘breakthroughs’ of the last 100 years were. One striking feature is the difference in responses from women to men. Women favour health-related developments and men, if anything, point at the internet. While this might perhaps be what intuitive gossip would suggest anyway, I find it a little startling to see it’s as large a difference as it is in print. I’d have to put health–vaccines in particular–ahead of computers, but mainly for an academic (and very off-the-cuff) thought that perhaps that better health in part enabled the later technological developments to occur by freeing up society to innovate. What do you think is the most important technological breakthrough of the last century? I’ll stick with vaccines for the moment. Maybe I’ll change my mind with more thought, but I’d be surprised. I’m not going to worry about the reliability of the polling, etc., here. This is a bit of trivia in the end of the day. IBM, naturally, also blow their own trumpet in listing their company’s contributions. I had to laugh at seeing the FORTRAN programming language listed. (I’m not being negative.) It’s interesting to see them list ‘tracking infectious diseases’ and ‘the invention of service science’. The latter I can imagine being a topic worth a separate discussion on this forum. 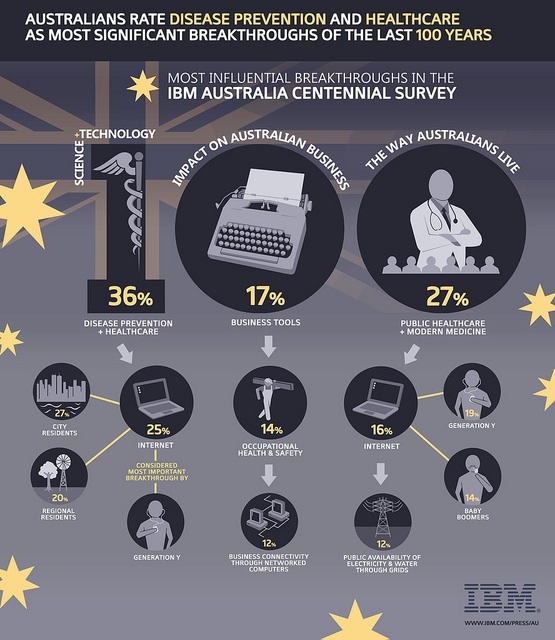 IBM’s press release for the Australian edition is here. I have to whinge. Why does the media not link to the original source? Is it really going to kill your business to let people see the original data for themselves? As I’ve argued elsewhere, it’ll improve your on-line creditability if your words are backed up with direct links. My instinct was to say the internet but then, perhaps what I mean is computers. The problem is that technologies are inter-related – without computers the Genome project would not have been possible, electronic health records would not be possible, certain aspects of drug design would not be possible. From a mortality perspective – the development of penicillin would seem to me to be a key development as well, though I understand your favouring vaccines. The problem is that it is difficult to what the world would look like without any one of these technologies.